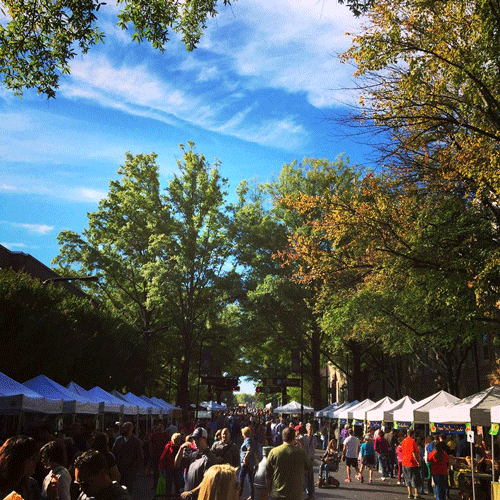 May signals the return of the TD Saturday Market in downtown Greenville and it's always a fun morning walking on Main Street and filling a basket with fresh produce and maybe a sweet treat too. Some weeks I bring the girls with me and we are always sure to bump into a friend or two or ten! There are many dedicated farmers and vendors represented each week with such a commitment to quality that I can't go wrong, but here are just a few highlights. I like to eat while I shop, what can I say. So depending on my mood I start at Soby's on the Side for shrimp and grits or Banana Manna for a little something sweet. Merciful Hearts Farms has something for me and for the girls. Deb Potter makes beautiful handspun yarns and she has a small station set up for the little ones to choose some colorful string and twist a custom bracelet on the spot. She also has the most delicious free range chicken and duck eggs. I will share one of my favorite poached egg breakfast recipes coming up in a future post. Split Creek Farm is an upstate institution when it comes to its award-winning goat cheese, milk, and yogurt. Their fromage blanc or chevre would be delicious on the Strawberry Poppyseed Salad I shared earlier this month. If you haven't made the drive out to one of our local strawberry farms to pick your own, Watsonia Farms has your strawberry needs covered along with asparagus, peppers, squash, and other spring and summer vegetables. I have an asparagus risotto recipe to share in the coming weeks. And then June brings peaches, possibly my favorite summer fruit! If you're looking for fresh pasta to bring home, Rio Bertolini and Naked Pasta have some incredible options. From ravioli to fresh cut linguine to tender gnocchi, you can't go wrong. Watch for a bright springtime gnocchi recipe with corn, arugula, and a light cream sauce. Looking ahead to summer months, I can't wait for tomatoes from Iszy's Heirlooms. Over 30 varieties and hands down the best in the area. I can taste the tomato pie and tomato sandwiches already! And then summer blueberries, blackberries, and figs from Happy Berry just can't be beat. Goodness I'm hungry already and can't wait to get in my kitchen and have fun with the bounty that spring and summer months bring to our little corner of the Upstate. It's a good time to be in Greenville!